As mentioned in an earlier post, real family vacations were few and far between when I was growing up. The day my dad told us we would be taking a trip to Florida for two whole weeks during the summer seemed like a dream. My mother proceeded to send for every possible brochure and map that corresponded with our proposed travel route. For months we poured over each picture and page and listed all the places we would visit...it would be a jammed-packed trip. After arriving in Florida, one of the first stops was the Sarasota Jungle Gardens where an unknown heavenly fragrance perfumed the air in their gift shop. As I walked around and looked at all the tourist stuff, I found dull-colored orange balls for sale. They were the source of the perfume...little orange blossom sachets...My mother let me buy a few to bring home. It was a sad day when they no longer perfumed my drawer...but, for a time, they helped to keep that vacation experience alive. Navel oranges are interesting in that they are actually all clones of the first single mutation from an orange tree in a Brazilian monastary orchard in 1820. The seedless-fruit mutation could only be replicated by grafting cuttings onto other varieties of citrus trees. According to historical data, two such cuttings of the original tree were transplanted to California in 1870, which eventually led to all of the navel orange trees in existence today. (While an occasional seed pops up, most navel oranges are seed-free). Today's recipe is for a delicious navel orange dessert. It is uncomplicated, inexpensive and looks beautiful. It is a favorite treat in our family and can be taken to any party as a festive contribution. 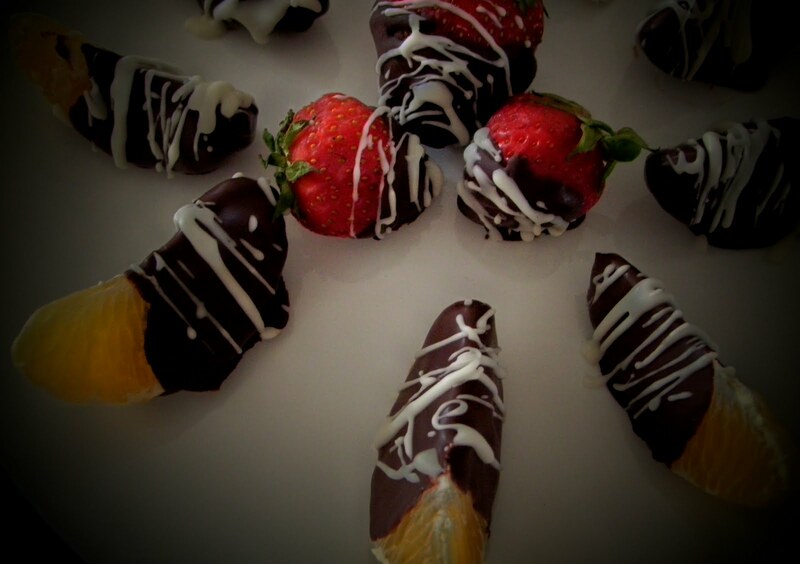 (Chocolate-covered strawberries ( #33) may also be striped). The coating ingredients will be enough for two oranges, 9 segments each. 6 servings. Carefully peel the fruit and separate it into segments. Try to not break the membrane, although I have coated broken-skin segments without any problems. Pull as much of the loose pith and white fibers off as possible. In the top of a double boiler, combine chocolate and 1/2 T of the shortening.When the chocolate begins to soften, stir until smooth. Remove from heat but keep over hot water. Tilt pot to make the chocolate run to one end. Dip one end of each orange segment into this well of chocolate, coating half of the orange slice. (Or use a spoon to pour chocolate over segment). Set segments upright on a tray lined with waxed paper. Do not let segments touch each other. Chill until firm, about 10-15 minutes.. Melt white chocolate and 1/2 tsp shortening using directions above. Stir. If the mixture is too thick, add more shortening. Dip a fork into the white chocolate and fling toward the orange segments to create thin stripes. Chill to just firm. Serve or cover loosely and chill up to 4 hours. Allow 3 segments per person. Note: the chocolate may be melted carefully in the microwave on MED temp. It must be done carefully. If it is over-cooked, it will be ruined. Idea: Before peeling orange, carefully, slice the zest to save for recipes calling for grated orange peel.